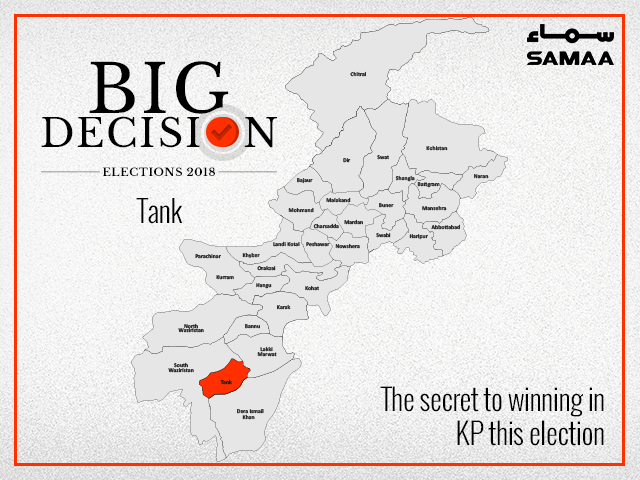 In district Tank there is only one National Assembly seat, NA-37, and one provincial assembly seat, PK-94, but a total of 23 candidates are vying for them. From NA-37, we have PTI’s Habibullah Khan. The MMA has awarded the ticket to Asad Mehmood, the son of Maulana Fazlur Rahman. The strongest candidate is expected to be Dawar Kundi. People here are not in favour of Maulana Fazal’s son despite the fact that the area is a stronghold of his JUI-F. Therefore it is expected that the JUI-F vote could go to independent Dawar. From PK-94, Irfanullah Kundi was given a ticket by the PTI. Ghulam Qadir Khan is standing from the ANP.